Earlier this month I was lucky(?) enough to have a spot on the excellent Museum Mile Museums Showoff special as part of the Bloomsbury Festival. For those of you who don’t know, Museums Showoff is a series of informal open-mic events where museum professionals have nine minutes to show off amazing discoveries, their research or just to vent steam to an audience of museum workers and museum goers. My nine minutes were about the 99% of objects that form museum collections but you won’t see on display. They fill drawers, cupboards, rooms and whole warehouses. But why do we have all this stuff? Who is it for? In my skit on Tuesday I only had nine minutes but I thought I’d take the time to expand on the 99% and the problem of too much stuff (particularly in natural history museums) and what we can do with it. Museums often display only the tip of the iceberg when it comes to collections. Here at the Grant Museum we have about 7% of the collection on display and it tends to be the Hollywood Animals that make the cut. At larger museums it can be less than 0.1% of the collection that makes up the public facing galleries. In my relatively short career as a museum professional I’ve been very fortunate to see behind the scenes in more museums than most and boy, there is a lot of stuff. Even though I love natural history and am very passionate about museums and the future of the museum sector sometimes I do wonder why do we have all this stuff? In natural history, the obvious and often made, argument is that our collections can tell us about global challenges that affect us all including climate change, organisms that cause or spread human diseases, extinction, agriculture and aquaculture and from geology the exploitation of fossil fuels. Natural history collections are the only record of life on Earth and if we are to make any models or predictions we need to dip into the data enshrined in objects. However, there are large portions of natural history collections which could never contribute to those agendas. All the ‘Raggy Doll‘ specimens without data for example. All those specimens that require four text books of explanation. Most fossil specimens can be used to reconstruct the past with only limited impact on what’s happening in the present. There are rooms and rooms full of bad taxidermy and taxidermy dioramas that for reasons of taste, health and safety and changing scientific ideas never see the light of day. 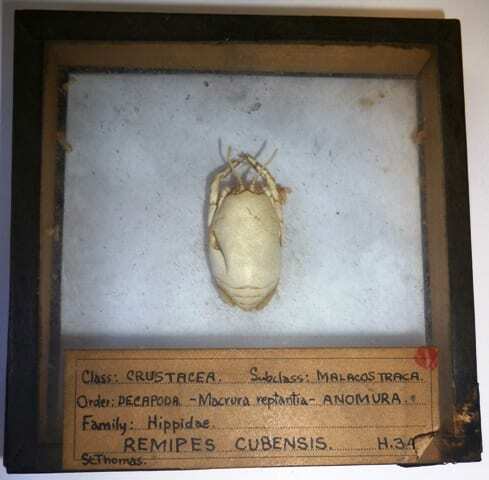 Even something as simple as an animal not having a common name (to put on a label) can keep a specimen off display There are large chunks of the animal world which simply aren’t being actively studied (for now). Lastly there are all the models, casts and those dreaded boxes. Spare a thought for specimens like this. Dusty, pest attacked, wrongly named crabs. SAD SMILEY FACE. So how do we make the most of the 99% now especially if they aren’t saving the world? Well, in short, it shouldn’t matter how important our specimens are to science. Every specimen has a story to tell.